There’s a new Kickstarter launched for when you like minimal, smart displays. 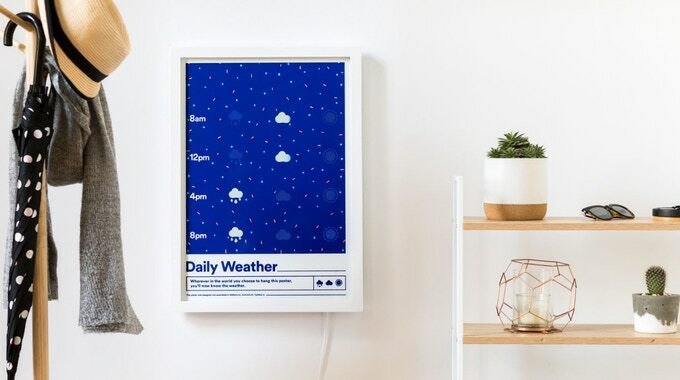 The weather poster by Typified is world’s first, live updating paper poster, featuring a special, smart ink technology. It simply shows you the weather forecast in a un-intrusive way. The poster will show you the forecast of the current day for 8 am, 12 pm, 4 pm and 8 pm, from your current location. This will happen automatically whenever the weather poster connects to wifi. Behind all of this is a service powered by Typified. After two years of free weather forecasts you can subscribe to further forecasts from Typified for $7.50 per year, to allow them to keep the service running further. The technology on this smart weather poster looks very promising. It doesn’t have the same annoying glare as smart LED panels, but uses special ink, printed on extra thick paper stock, to change the information you see each day. The Typified Weather Poster is ideal if you want to not look at your phone for every bit of information. It will be produced in runs of 500, each sporting a different design.